Here are some projects that will help to bring the generations of beaders together in your family this year. I wouldn't recommend putting the beaded tea lights on your tree, but all the rest of these projects make nice tree ornaments as well as table top decorations. Small beaded Christmas tree - a great way to use up all your leftover beads! 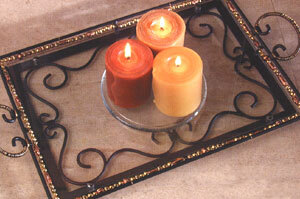 Beaded glass serving tray - choose beads and wire to match you own decor. Beaded snowflake ornament - beads and pins...easy easy easy! Golden beaded pear - not difficult to make but a bit time-consuming (shown above). Can you picture a set of these in a bowl on the table or hanging from your tree? Star, candycane, and wreath - easy to make beaded ornaments that kids will enjoy helping with. Safety pin tea lights - I've seen lots of flag pins and bracelets made from beaded safety pins, but I've never seen tea lights before! Fuse bead ornaments - another great project to do with the kids!